A few days ago, I had the pleasure of talking with Stephan Schmitt, founder of Native Instruments and creator of Reaktor, and guest teacher at big brain audio. In an earlier interview, we talked about Stephan’s beginnings at NI and his musical evolution. In the following interview, he tells about his new company, Nonlinear Labs and his plans for the future. Rumor has it that you have left Native Instruments. Can you explain? Yes. A few months ago (in November, 2011) I started a new company, Nonlinear Labs. But at the same time, I am still involved in specific projects with Native Instruments and will continue to do so. The relationship between Nonlinear Labs and Native Instruments is based on friendship and cooperation. There will be no competition between the companies. After all, that would be absurd – I am still a shareholder at NI! How is Nonlinear Labs different from Native Instruments? First of all, the size! When I started NI back in 1996, there were just two of us, Volker Hinz and me. Now, there are more than 300 employees at NI. Obviouly, things are radically different in a small company compared to one like NI has become. As a company grows, it is necessary to have more specialization and a strong organizational structure. While this is absolutely essential to enter and compete in the markets that NI is in, it can also be a disadvantage if you want to take certain kinds of risks and maybe undertake things that are counter-intuitive for a larger company. And then there is the focus. I plan to develop specialized instruments, effects, and controllers in a higher price segment for niche markets. My core interest lies more with creating musical instruments for live musicians rather than studio production gear. I’ve always been drawn to the real-time world, where performance is more important than production. That goes all the way from sound generation – real-time synthesis rather than pre-recorded samples – to actually making music with high-quality keyboards and controllers rather than with sequencing software. Nonlinear Labs is about creating tools for musicians. That might sound banal, but I think a lot of music tech has moved too far away from the idea of performance nowadays. With all that is available today, anyone can put together a “track” – and that’s a good thing – but I think the actual quality of musical performance has not been addressed enough in recent years. But there seems to be no end to controllers and keyboards on the market! Certainly, but very little of any notable quality that a serious musician would really want to play! Musicians have always had a very intimate relationship with their instruments. Traditionally, it hasn’t been about picking up a violin, playing a few notes, and then tossing the instrument away in order to grab a clarinet on the next day… A musician practices, works, plays, and gets to know his instrument. A relationship develops. It’s a commitment that spans over a large part of a lifetime. This is largely missing in today’s world of music technology. I’m interested in developing high-quality, long-lasting electronic instruments that musicians want to invest in. I’m not talking about investing money as much as I am talking about investing time. To make this possible, you need to have trust in the instrument and its long-term future. Besides hardware quality requirements, the software running “under the hood” needs to be open source. Otherwise the user would be locked in a proprietary software solution. After starting one of the most successful companies in the music tech industry in recent years, do you think something like open source can be part of a viable business model? Things have changed quite a bit over the last decade and there are a lot of very interesting open source projects that have become motors for creative development in many fields. I would much rather be part of a big movement of sharing technology and know-how than try to develop proprietary systems that try to bind musicians to the fate of a single company or patent-holder. Right now, I have the opportunity to really do what I want, what I really think is important, taking a “boutique” approach to really crafting something solid, well-built, and yet open and with a lot of possibilities for musicians and 3rd-party companies to develop further on their own. “Solid”, “well-built”… It sounds like the German engineer is talking! Well, maybe he is! But I am also a musician, I have been playing keyboards for a very long time, for a while going very deep into the classic Yamaha synths, like the DX7. I have always been looking for increased expressive possibilities with sophisticated instruments. On the one hand, this is about the hardware – the keys, knobs, sliders, and buttons, the pedals, the whole interactivity of a musical instrument. On the other hand, it is about the sound possibilities, the audio engine that is actually generating the sound. Do you already have products that are ready to launch? Not yet. And we are not in a huge hurry. It took us around three years to create a first very basic version of Reaktor (actually Generator) back in the mid–1990s. Right now, Nonlinear Labs is just starting out and we are more in an R&D phase than anything else. At the same time, I believe in a cycle of rapid iterations, involving a feedback-like process of prototyping, testing, development, and design. I want to eliminate long planning phases, where you have nothing concrete to put your hands on, nothing concrete to show people. To achieve this, you need local manufacturing. You mean “Made in Germany”? I mean “Made in Berlin”! It’s not about chauvism or anything. It’s about proximity and all the good things that come with that. I want to be part of a constant feedback process of ideas, prototyping, and re-thinking and starting all over again with the ideas and prototyping. It can be a huge advantage to do the research, design, and production all in the same place, the same city. No more long flights across multiple time zones! We are living in a very exciting time, because a small company can really push forward, thanks not only all the networking possibilities that we have now, but also because of new technologies like 3D printing. So you’re going to print all your hardware? Probably not, but we will see! With 3D printing technology we are at the point now where you can conceive of a complex object and then have it in your hands after a few hours. If I am not happy with the size or feel of a knob, for example, I can easily print out a slightly modified one. Costs and times have come down so much for trying out new pieces of equipment. This is a huge shift! While definitely driving down development cycles, 3D printing can also be considered for producing parts of the final product. We are excited about exploring such new options, which would allow us to build our instruments on demand in customized versions. Native Instruments, Ableton, Magix, SoundCloud… all of these firms are in the “new” Berlin, either in Kreuzberg, Friedrichshain, Mitte, or Prenzlauer Berg. You have opened Nonlinear Labs in a part of West Berlin that wouldn’t be considered trendy, isn’t part of the “scene”. Why? In terms of research and development, it’s a very interesting part of Berlin. There are a number of public and private high-tech institutions in the area, including the Technical University, various automobile research facilities, and so on. And to be honest, in the past years I’ve become a little tired of the trendy “scene” in parts of Berlin. In many ways, there’s a lack of authenticity, a lack of substance, that has driven me away. Many people will be asking – maybe in a near-panic – “What about Reaktor?” Now that you are no longer working at Native Instruments, what is the future of Reaktor? Actually, I haven’t been directly involved with Reaktor development for nearly two years now at NI. Obviously, I use it all the time and have created a number of Reaktor instruments, like Reaktor Prism, Spark, and most recently Skanner. It is a fundamental part of my ongoing development of new instruments. And the actual core development of Reaktor has been doing fine without me! You have to realize that Reaktor remains a very central part of NI. First of all, it is the prototyping tool for new instruments and effects at NI. This goes way back to origins of Pro–52, the B4, FM7, and continues through Guitar Rig, Massive, and many of the Maschine and Traktor effects as well. Right now, there are several product ideas that are being prototyped in Reaktor. And that will also be the case in the future. In addition, Reaktor Player has become an important platform for bringing new instruments out on the market, like the very popular Razor, or the Time Exile instruments like the Mouth and the Finger. And there is a lot more in the pipeline! 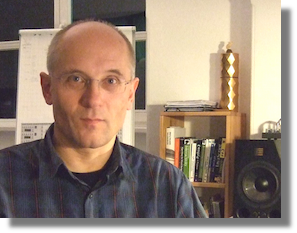 Stephan, thank you very much for this interview – I wish you all the best for Nonlinear Labs!